I believe there are two types of design - design that reinforces the existent status-quo and design that seeks to undermine it. By 'undermine' I don't just mean Banksy-style knee-jerk radicalism, but design that probes, critiques and questions, that seeks to outline new models or propose alternatives. I even include functioning products that work outside of the system or create a new system. However, the former, most usually, seeks to make money and by doing so reinforces that market-based model. There's no problem with status quo reinforcement. For a start, it makes critique all the more pertinent. Secondly it is laced with it's own perverse incentives and secondly it's where the vast majority of true innovation and creativity come from. It's resources and capabilities can never be even approached by the pariah of rebellious design. But the Little Printer is a wolf in media-sheep's clothing of the worst possible kind. The obvious and facile criticism is the idea of paper. Yes, environmentally unfriendly but conceptually interesting, playing into ideas of slow information and careful editing to de-filter ourselves so I see no real problem there. However, the headline 'Wish List: Gimme Gadgets!' is perhaps the most obvious and unintentional self-deprecation that opens up my point. WIRED has a propensity for cramming pages full of inaccessible hi-fi's, climbing equipment, bicycles and boy toys of astronomically inflated value, affordable to a tiny percent of sane humans alliterated with whacking great price figures next to them just to outline the life you COULD be leading if only you were more ... 'more.' Into this fray they have pushed Little Printer. To say it's BERG's fault would be entirely wrong. Yes, it's over $250, but that's not an intentional attempt to bestow it with desirability-value to people who order their shopping searches most-least expensive. It's over $250 because it's well made and bespoke and a lot of work went into it. They love their technology and that's obvious and great. It's a clever little thing they've made and the point has been made to me many times that the interesting part is not the gadget but the cloud and the legacy they've built to support it. It's the worshipful coverage that is what is wrong with this thing. Touting this thing to the type of people who avidly scan every page of WIRED and it's cohorts as the future of technology is a terrifying mistake. These cohorts turn that $250 price tag into a badge of honour to own, not a mark of achievement. They outline the same future that is sold by Apple, by Microsoft, Samsung and Monsanto instead of BERG's place as trying to question alternatives. This is not the future it's only one of a myriad group of futures. And this particular future is exclusive to white, middle-class, urbanised, highly tech literate, disposable-income men and that is not a future that we should be reinforcing. 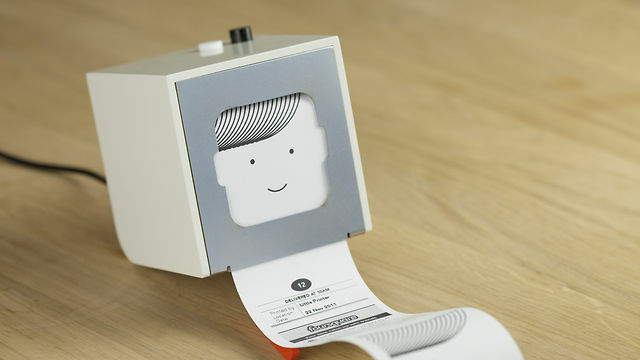 The Little Printer probably will change the world, if only that these debates about how we read this type of technology and how we position it become more common. And hell, the infrastructure they've built for it and are now concentrating on might just become the backbone of the next few decades of the web. We don't need to justify interesting products as simultaneous 'gadgets' and 'world changing' in order to somehow justify they're existence. The media has to learn to accept that.